Grapeland-Texas Festivals are a dime a dozen, as Texans seemingly find reasons to celebrate. 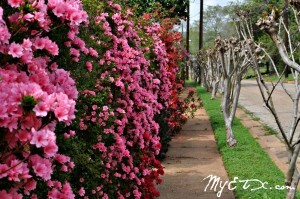 Festivals in the state are held in the name of flowers of all kinds, practically any kind of fruit you can think of, rattle snakes, chiggers, oil, kolaches, Shakespeare, and even the movie, Lonesome Dove. But not all community festivals catch on, and there are certainly none like that of the Grapeland Peanut Festival. As Grapeland prepares to celebrate its 66th annual Peanut Festival, one can’t help but acknowledge the deeply rooted heritage and tradition associated with the festivities. Grapeland’s first attempt in 1913 to develop an annual celebration has long since faded from memory, however it didn’t involve peanuts. Rather a marsupial common, if not distinctive to East Texas, became the centerpiece of the community’s festival. The first Annual Grapeland Possum Walk, a two day event, is said to have drawn a crowd of 5,000 plus visitors, that poured into town by way of the Model T , morning trains, and horse drawn buggies. Approximately 200 possums that had been previously captured for the event were corralled at the starting point of the possum walk way that was constructed for the event. The possums completed their procession, a moment of glory, after which they became possum stew with sweet potatoes, and barbecue. The following day, Grapeland townspeople and visitors enjoyed the possum dishes, of which many considered to be an East Texas delicacy. The Possum walk even inspired a poem. Trottin through that Grapeland sand. Up there in Grapeland sand. 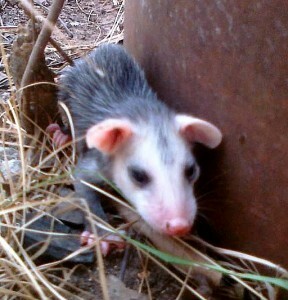 Think of Grapeland’s possum trottin’. Possum walks, turkey trots, and fairs were nothing new to Grapeland by 1945, but it was time for a change of pace. Peanuts had become the biggest crop production in the area, as the sandy soil proved to be ideal for growing peanuts. It seemed only fitting that the end of the local peanut harvest be celebrated with a festival. The Grapeland Chamber of commerce began planning for the event, which has proved over the last 66 years to be a a success. The Grapeland Peanut Festival, first called the annual “Goober Carnival,” was inaugurated Sept. 27, 1945. The festival over the years has grown into a major harvest time production, despite the decline of peanuts actually harvested in the area. The Goober Carnival made its debut on a Thursday evening, with a banquet of various peanut products that were served to some 400 people. Friday afternoon a fiddler’s contest was held, with fiddlers, fiddle bands and quartets vying for the title. That night the first Peanut Queen Coronation was held, in which Frankie Lois Richardson was crowned the first Queen. The first festival was claimed to be a great success for Grapeland, and peanut growers, even though the following week local growers lost thousands of dollars due to heavy rains that saturated the crops causing a massive crop failure. The rains may have doused the crops, but local’s spirits were not dampened. The Goober Carnival continued for the next six years. In 1951, the Goober Carnival ended, and the Peanut Festival was born. The Peanut Festival has stood the test of time, and continues to draw in visitors, as well as call home those who have ventured off. October 6, at 6:00 p.m. the Peanut Festival begins with Family Night in the Grapeland City Park. Arm bands will be available for $15. Carnival rides and candied apples will be available for all ages to enjoy. Friday will be a busy day around Grapeland as locals prepare for the full force of festivities. The community will gear up for Homecoming with a Homecoming Pep Rally in the Grapeland High School Gym to cheer on the Sandies before they face off against the Dragons. The Sandies will take on the Shelbyville Dragons during their Homecoming Game at 7:00 p.m. During half-time a Homecoming Queen will be announced. After the football game Main Street will become a landing spot for anyone who would like to shake a leg at the Street Dance. This year’s annual street dance will feature Sam Moore, a former Grapeland resident and Grapeland Sandie, from 10 p.m. to 1 a.m.
Saturday’s festivities will kick off early for some, as the 5K race gets underway. The 5K Run will begin at 8:00 a.m. at Salmon Lake Park, and will benefit the Grapeland High School Athletic Boosters. The annual Peanut Festival Parade on Main Street will begin at 10 a.m. A procession of floats, all shapes and sizes imaginable, antique cars and tractors, bands, youth organizations, and politicians will make their way down Main Street, waving to friends and family gathered on both sides of the street. Afterward everyone will relocate to the city park to enjoy the festival. Peanut Festival-goers will then enjoy live music, festival foods, arts and crafts, and carnival rides. This year a record number of vendors have signed up, so look forward to a variety of booths. The weekend will come to an end when the 66th Peanut Queen is crowned. The pageant will be held at 7:00 p.m. in the Lorena Shoultz Auditorium. One of four contestants will be named as the 66th Annual Peanut Queen. This year’s contestants are Madison Kellum, Bethany Owens, Andi Huff and Katharyn Goosman. Tickets for the coronation go on sale Monday, September 26, 2011 at Walling’s Pharmacy on Main Street in Grapeland. Walling’s is open Monday through Friday from 8:30 a.m. until 6 p.m. Tickets are $10 per person. The annual festival t-shirt is on sale and can be purchased at Prosperity Bank on the By-pass in Grapeland as well as Grapeland State Bank on Main Street. They are $10 a piece. Texas Festivals often celebrate a town’s heritage or local bounty. Other festivals across the state bring art and live music to their community. Some festivals are held solely as a means to produce money, while other festivals are held with only the intent of offering an opportunity for people to gather as a community. The Peanut Festival is held for all of those reasons. It is a grand reunion for citizens, topped off with every bell and whistle, and something for everyone. What’s Up At Liberty Hall? 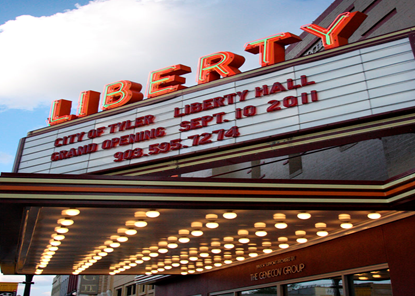 Tyler, Texas- Movies, comedy, live performances and more! East Texas- Thunder in January means more than rumbling in the sky to many East Texans. For many, many years East Texans have been predicting the weather by trying to make heads or tails of signs from Mother Nature. The state of the weather is often the first subject people discuss when they meet. If you are living in East Texas it is highly likely you have been hearing thunder that began yesterday evening on January 8. What does thunder in January mean?